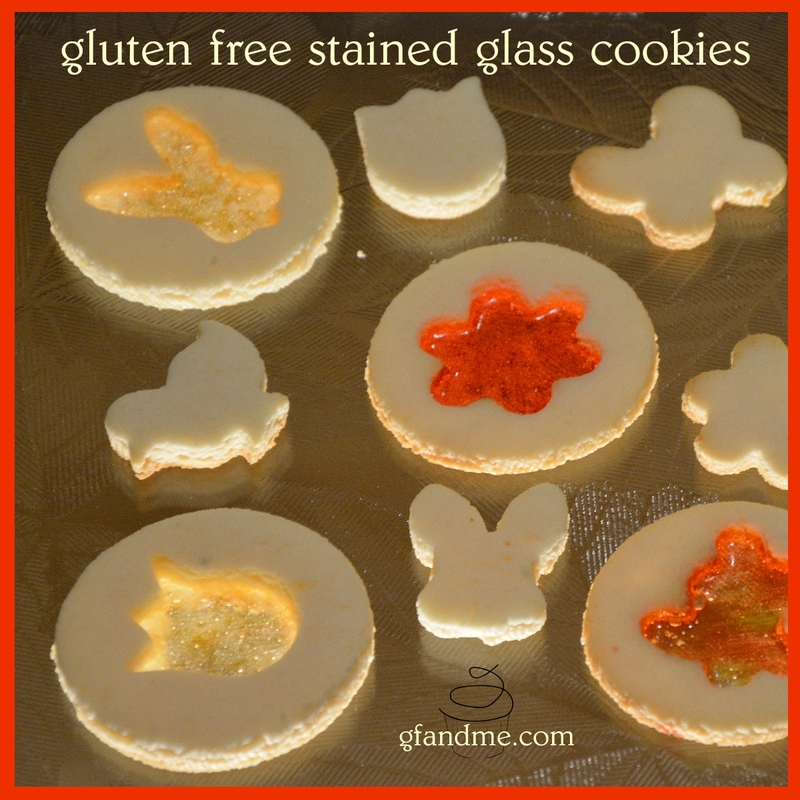 stained glass Easter cookies – gluten free, of course! I have wanted to make stained glass cookies ever since I saw some gingerbread stars in a magazine last December. When I came across some small Easter-themed cookie cutters, I figured spring would be the time to give it a try! The trick turned out to be finding a cookie dough that doesn’t spread too much. If the dough spreads while baking, it will obliterate the stained glass window in the middle. I tried to refine our brown sugar cookie recipe by adding more gf flour and using shortening instead of butter, but by the time I got the texture right, the cookie itself was dry and powdery. Then I remembered a recipe I’d seen on Simple Gluten Free Kitchen for linzer cookies and I decided to try it. It worked great! The dough rolled out nicely, didn’t spread too much, and the result is a mild almond and vanilla wafer. Besides stained glass cookies, these would be great glazed or sandwiched with jam or Nutella. Scroll down for the recipe. Beat butter, vanilla, and sugar until light and fluffy. Add egg and combine. Mix dry ingredients together in small bowl and slowly add to the mixer. When fully combined the dough will be soft and stick together. Remove from mixer, divide into thirds, wrap, and refrigerate until firm. When you’re ready to bake, preheat your oven to 325 degrees. Remove 1/3 of the dough and roll it out to ¼ inch thick. TIP: Rolling the dough between two pieces of parchment will keep the dough from sticking and will result in a smoother finish. Cut out your rounds. We used a 2 ¼ inch diameter cutter. Now cut out your centres. We used small Easter themed cutters for the middle. TIP: If you want to hang your cookies in a window, make a small hole in the top of the round using a fine pastry bag tip. Remove the dough from the centres of the cookies. You can either bake these centres as small cookies or re-roll them with the rest of the dough. TIP: I found that I could remove the centre with the small cookie cutter by pinching the cutter slightly as I removed it from the dough. Place the cut out cookies on a parchment lined baking sheet. TIP: If your surrounding ring of dough is too narrow, this can be difficult to do without the cookies losing their shape. If this is the case, you can bake them right on the parchment paper on which you rolled them. Just move it onto a cookie sheet and you’re good to go. Take a lifesaver and smash it with the handle of a butter knife or a meat tenderizer. TIP: If you buy the individually wrapped lifesavers, you can smash them in their packages to keep the mess in check. These candies pretty much explode when they break! Place the smashed lifesaver in the centre of a cookie. If you get candy on the surface of the dough, you can brush it off with a soft pastry brush. TIP: You can combine colours and have fun filling in the shapes. Bake for 10 minutes or until just turning golden on the bottoms. Remove from oven and let cool before removing from the parchment. The candy centres will be molten! This entry was posted in Baking, Recipes and tagged almond flour, celiac, cookies, gluten free, holidays, potato starch. Bookmark the permalink. Oh wow! These look so neat! Thanks! They look great in a window too. Thanks! I’ll try to save some for Friday. We already ate all the green ones! Yup, that’s it. Super easy – at least that part is. Rolling everything out takes a bit of work and practice. You’re so welcome. Hope you enjoy it as much as we do!